Don't wait until your guests are on your doorstep to decide where they’ll sleep. 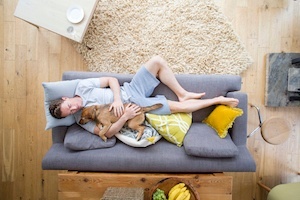 Will you use a sleeper sofa or an air mattress? Maybe you'll take the sofa and give them bedroom privileges. Once you arrive at a solution, give it a dry run. Spend one night sleeping as a guest to get some perspective and make any necessary adjustments. Chances are you'll have to maintain some semblance of an everyday schedule while your guests are visiting. Have sleep masks and ear plugs on hand so they can sleep undisturbed. A folding screen is a good way to provide privacy, and it can be stored out of the way when not in use. Everyone has their own internal thermostat. Have a few blankets of different thicknesses so your guests can be comfortable no matter what time of year it is. It's hard to feel comfortable when you're living out of a suitcase. Carve out some closet and dresser space where your guests can keep their clothes. If that's not possible, a luggage rack makes a nice compromise that at least keeps their bags off the floor. Take a cue from luxury hotels and put together a welcome basket with goodies to make your guests feel pampered. Items can include travel-size toiletries, device chargers, magazines, bottled water and chocolates. Your imagination is the only limit! You probably won't be able to spend every minute entertaining your guests, but don't leave them to fend for themselves. Have information ready about recommended tourist sites, restaurants, outdoor activities or any other places they might like to visit. Make sure your guests have a set of keys if needed. There may be times when they just want to kick back and relax, so write down the WiFi password and information about TVs and music systems, such as which remote does what. There's a reason why aromatherapy is so popular. Essential oils promote a number of health benefits, including more restful sleep. Keep your home infused with lavender or another relaxing scent for a luxurious feel. People like to start the day at their own speed. Set up a breakfast bar and/or coffee station so it's ready for early and late risers. Have you learned a great tip to make guests feel at home? Share it with us in the comments!